What is Simple Arcade Multifilter? 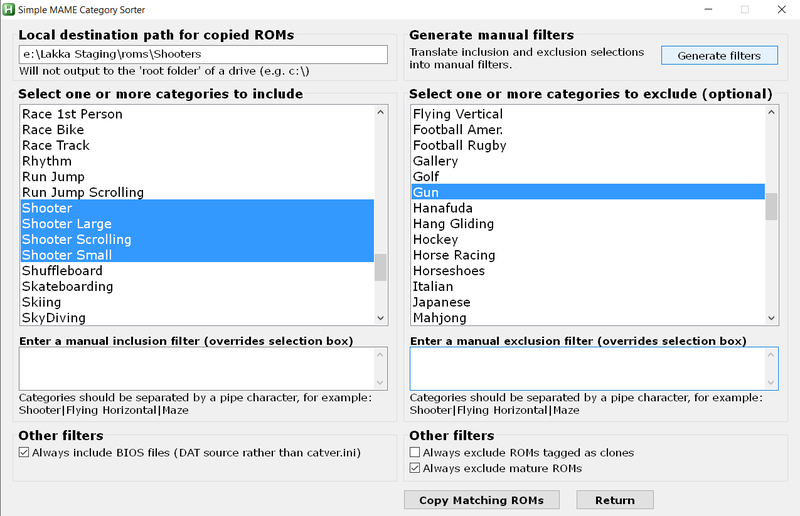 In order to work correctly, the Simple Arcade Multifilter requires a XML DAT and a catver.ini that matches the version of the arcade ROM set exactly. DAT files generated by the FB Alpha software are the recommended source for FBA XML DAT files. FB Alpha collections can be sorted by finding the catver.ini from the MAME set which your FB Alpha collection’s ROMs were originally derived from. Integrate Gamebases (C64, Amiga) and MAME-Filter in Lakka...? Guide To Building MAME 2003 PLUS Romset? Thank you for this. I have been looking for a tools like this since romlister and the upcoming Lightspeed Mame rom manager. This will definitely come in handy! Would you mind also posting this on the RetroPie forums where I think it will be well received! For example, this is a set of MAME 2003 playlist filters inspired by Alexandra’s Pretty Curated Playlists guide. Playlist: Arcade - Misc Inclusion filter: Misc. hello i confirm this strange behaviour, i selected “copy bios files” but no bios files were copied, plus i made some tries with “mechanical machines” excluded i obitained for two times TWO DIFFERENT RESULTS!! @Yurif74 it sounds like my parsing function is not handling your data correctly – often this is because there is some slight changes in how MAME formatted metadata over the years. I will try to fix this. Could you please let me know which MAME core you are using? 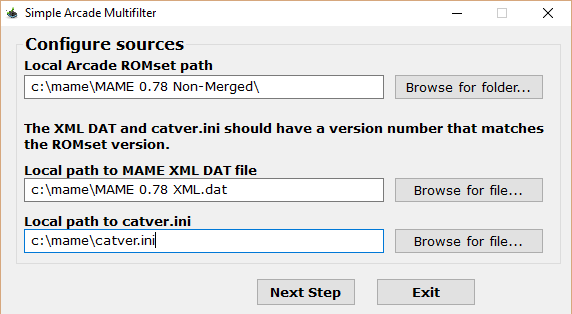 What are the versions your catver.ini and XML dat files? @shakalakka I am embarrassed that my app is evidently the source of your problems with the more recent versions of MAME! Your report took me straight to the problem. There is an issue in the code path for Device and Mechanical ROM sets. The app does not apply the filter to those files consistently now. I should be able to come up with a fix pretty quickly. I’ve just uploaded an updated version with today’s date that corrects the BIOS inclusion filter so that it now also encompasses Devices and Mechanicals for more recent MAME versions. I also worked a bit on the labels to make the other filters clearer to understand. If you notice any more issues @Yurif74 and @shakalakka please feel free to let me know. Thank you for your help testing this! Non-Merged and Split sets should work exactly the same. Merged sets will only be seen as the parent ROM (as with RetroArch) but otherwise they should work too. That is at least one issue that this app shouldn’t have trouble with! That is a good idea - I’ll see what that would entail next time I’m working on the GUI. edit: I just received another GUI suggestion from the French Recalbox forums, to add a ‘browse’ button for Configure Source https://forum.recalbox.com/post/50182. Wanted to make sure that gets logged here as well. There is a crude way to abort – if you see the joystick icon for the app in your Windows system tray (usually the bottom right) then you should be able to right-click and force the app to exit. I just posted an updated version dated March 6 that incorporates “browse” buttons that can be used to configure the various source and output paths per requests in the RecalBox forum. Welcome to the future! but how can i start the process ? LOL, that is one way to know I may be starting to put too many options on that menu. I have just pushed an update that shrinks the category selector vertically by 30px. Could you confirm that menu now fits within your screen? new version runs great. bring another 60 bios/device-files to my set. Thank you for this improvement. The new browse buttons are very helpful, too! will do some testing arround with mame next days and report here if anything going wrong with the romset/playlist. for now it look pretty usable to me. EDIT: maybe markwkidd can add a “bios/board” depending filter (similar to the one in CMP) as workaround? Yes I want to work on this issue and I’m trying to decide whether to proceed by modifying the DAT files or the catver.ini files. Hmm.